President Uhuru Kenyatta’s Twitter account was deactivated to clean up access, State House has said. The action was also taken on all other social media profiles that have been posting on behalf of the President. 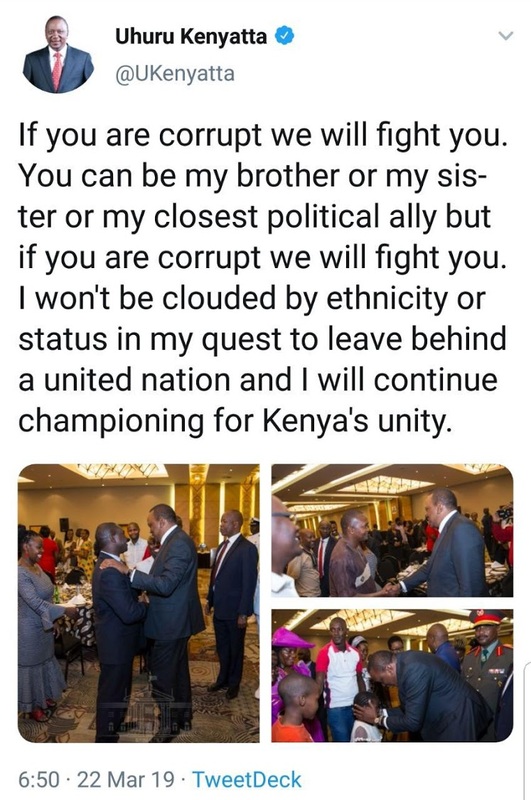 The Star has established that the sentence, “If you are corrupt we will fight you. You can be my brother or my sister or my closest political ally, but if you are corrupt we will fight you,” was the bone of contention. Officially, State House Chief of Staff Nzioka Waita on Friday said there are “unauthorised” individuals with access to the President’s social media accounts. “All official social media handles for the President have been temporarily suspended to allow for the necessary remedial measures to be undertaken,” Waita said. However, it has emerged that the ‘closest political ally’ was not supposed to go out on the official communication. This, however, happened with the tweets and the email dispatch from the Presidential Strategic Communication Unit. The phrase ‘closest political ally’ which would be construed to mean Deputy President William Ruto was edited out of the video and audio dispatched by PSCU to newsrooms. This is not the first time that Waita has taken such action after previously deactivating accounts that were associated with the PSCU. In July last year, Nzioka announced that the official Twitter channels are @StateHouseKenya, @UKenyatta, @FirstLadyKenya and @KanzeDena. Twitter handles – @PresidentKE and @PSCU_Digital unit – were subsequently deactivated in the purge. “All official communication originating from the President’s Strategic Communications Unit will strictly be communicated through the listed channels,” Waita said at the time. He added that State House will not accept liability or responsibility for any inaccuracies arising from media outlet’s reliance on unofficial channels.